Victory Condition: Gain more falls than the opponent by the time that the time runs out. Rules: anything goes, fall can only be obtains in the ring via Pinfall or Submission. Reiko Shishigou wasn't exactly sure how to feel about this. She was in Friction now, it was a fair bit of a change from her usual wrestling contract. It was of course a bit bigger than she was used to and now she had also gotten a bit of a name to her. Meaning she was a bit more famous than she last wrestled here in Tokyo. She was interested in what kind of a match this was, to be her first match and all in Friction it seemed like a rough one. Ironwoman was no joke after all, but it seemed as if they wanted to test her talents to the utmost. Reiko didn't mind that very much, as she would, make sure her outfit was put on her as good as it could be, that lion head marked one piece that snuggly hugged her impressive frame. When she walked out onto the ramp, her music playing as the crowd would give her a somewhat luke warm reception. She was known in Japan, and in Tokyo, but she wasn't an icon that everyone cheered for yet. That would have to wait, it would come with time. Reiko continued her march down the ramp, that impressive frame of hers making it's way into the ring and she would move towards the ropes. Climbing the turnbuckle and releasing a loud roar. The Lionheart was ready to fight, that much was sure. Jumping down the turnbuckle she would walk up to the center of the ring, folding her arms under her impressive rack as she would look up at the top of the ramp. Of course she was looking to face off with whatever woman would be brave enough to face her in as grueling match as this one was lined up to be. Pyrena wondered on how long it has been since she has been in this very ring. Quite a long while in fact. To the point where she started to wonder if she done something wrong to piss of the higher ups. The Red Amazonian would just bide her time and keep herself in fit, tip top condition. It wasn't hard to do so within the gym where there's always a chance for a good spar. But while she's been away, there were a lot that have passed her by. So many opportunities she's missed. Good ones too that would have catapulted her to the top. Since coming back, Pyrena thought to herself that things will be different. This was her time to shine. This was her year..
And she was going to start it all off with a bang. One hell of a match set up for her. An Iron woman match that is known to test the limits of another. This was perfect, just what she needed to break out and get a good start. And it looked like her opponent is strong too. Which makes things all the better.. The bombastic trumpets brought a good reaction to the crowd as the Red Amazonian cones out to the ramp. Her ring gear took am interesting tweak as her corset ended up being a top that exposed her taut and strong abs. Everything else is mostly the same and the Greek warrior strode down the ramp with reinvigorated purpose, smashing the spear and shield together with a mighty clang. Placing the makeshift weapons outside of the ring, Pyrena claimed into the ring, raising her hand up to get the crowd pumped as best as she can. Now she could get a very good look on her opponent. Looking strong, pretty strong as Lionheart stood in the centre of the ring. The Red Amazonian came up, extending a hand out in a act of good grace and sportsmanship. "Well you look tough." Pyrena smiled. "I'm looking forward to this match even more now that I got a good look at you.. The Lionheart would watch as the rather extravagant entrance of her opponent came to light. The blond would wait in her corner as the redhead made her way down towards the ring. She looked like she would provide a fair challenge at least, the Japanese native would fold her arms under her impressive bust and start to step forward. So that when the redheaded Amazon came into the ring, she would get up into the center along with her. 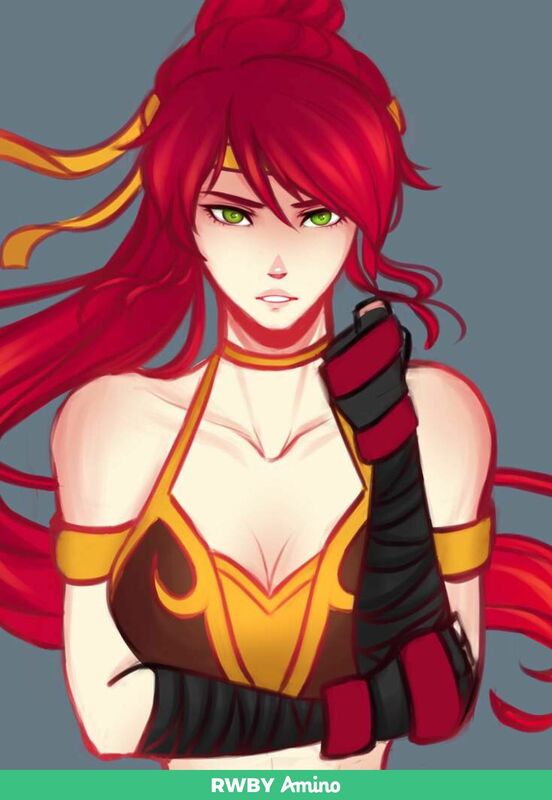 She would watch as the redhead, Pyrena...seeing that hand being offered towards her the blond would do a very slight nod as she would take a hold of that hand, accepting the handshake and keeping her eyes locked with the mighty looking redhead.
" Feeling is mutual." The Lionheart stoically spoke towards her opponent, as she would next break off the handshake and back up a step or two. She would wait for the referee as she wanted this match to start as soon as possible. Facing off against this redheaded warrior woman would be a good proving ground for her time here in AFW. A great first trial! It had been a long while since she got to do that, and the crowd loving her entrance as always, Pyrena finally getting used to playing with the crowd in some way. But for this match, this was already gonna be so good for the Red Amazonian as they both stood in the centre of the ring. Getting a good size up on the Lionheart. Pyrena thought as much to start things off in a good way, extending her hand out for a handshake. To which Reiko agreed. 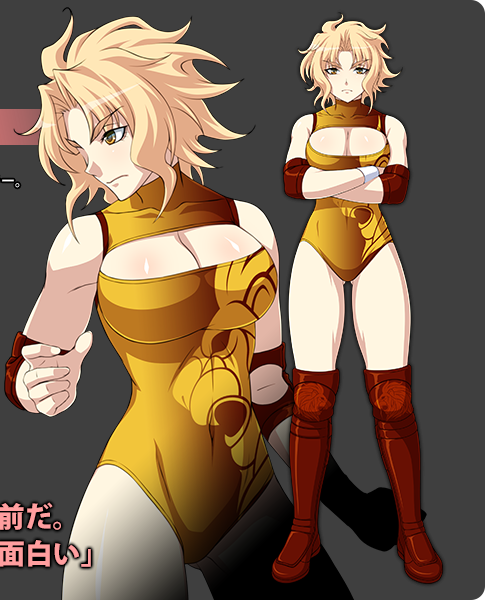 Pyrena would nod back at Reiko's stoic response, keeping her eyes locked with the blonde as they soon break away. Taking a good two steps back, the Amazonian giving a nod to the ref to let her know she is ready, crouching down a bit, as she awaits the bell to ring. Finally, once the ref did his checks, the bell would ring and Pyrena would come towards the mighty looking Lionheart. Bringing her hands up, wondering if Reiko would go for a lock-up. Just to get a good feel of her opponent. With both of them ready and the redhead nodding an all clear to the referee, Reiko would do the same, the referee called for the bell and with it the match was on the way. Remaining standing with her arms raising slowly, eyes fixed on her opponent. A fierce determination only fit for that of an actual lion, in the eyes of Reiko Shishigou. The blond would crack a slight smile, just every so slight by the corners of her lips, as she saw Pyrena raise those arms of hers and move in closer, offering a lock up. Reiko would take a step forward, a deep breath being taken from the Lionheart as she next would aim to move in and try to lock up with the redheaded Amazon. Aiming to slip one hand to the back of Pyrena's head and the other grabbing at Pyrena's arm. Going for a standard Collar and Elbow lock up, for the moment she wouldn't put any power into the lock up....waiting for Pyrena's strength before she'd decide how much she herself needed to use. She had a feeling this one would love a good lock up and what way than to start things off with that? Pyrena kept her arms up and was pretty honest with her own intentions. Eyes fixated on the lioness as she took a step forward. Soon their own hands would grab onto one another. Reiko's hand placement was clear that she wanted the standard collar and elbow lock up. Which Pyrena could certainly agree too! The Greek woman would do the same, the calm before the storm somewhat. Reiko was clearly waiting to see Pyrena's strength. Well, she shouldn't keep her waiting then. Pyrena wasted no time at all in trying to push Reiko back, feet digging to the canvas as she seeks to bully the lioness back to the ropes if she can, but also more curious in seeing what Reiko was made of! Reiko certainly was a fan of lock ups, but she was more interested in seeing what this league could offer than showing what she could offer. So when she went forward and got into position for that collar and elbow tie up, she waited...watching the redhead closely as she came in and accepted the collar and elbow lock up! The match was on the way, and it looked like Pyrena wasn't about to disappoint! As they locked up, Pyrena was quick to ramp up the pressure as she took to showing off her might, mangaging to catch Reiko unaware as she was forced back a step, yet the lioness braced her feet and stopped any further advancement! Being quick to flex her own impressive muscles as she would throw a light smirk the way of Pyrena. It seemed as if her opponent was a tough one! So she would have to respond in kind, aming to push forward as she'd use some of her own impressive might to try and shove Pyrena backwards in the lock up! Pyrena didn't want to waste time in finding out Reiko's strength, starting to push onto the lioness. She believed that Reiko didn't wish to waste time either and just go straight at it. She at least deserved that much. Now things were underway and the blonde responded in kind, stopping any further advancement and pushing onto Pyrena. The Red Amazon flexed her own muscles within the lock up, taking a step back but no further once she really got going! "Not bad..." Pyrena grunted, never relenting in her showing of strength! The two of them had now locked up for real, having recomposed herself after the sudden burst of power from the redhead, Reiko had managed to put a stop to her advancement. She even managed to force the woman back a step, before the Greek Warrior-woman was able to put a stop to the lioness's advancement! 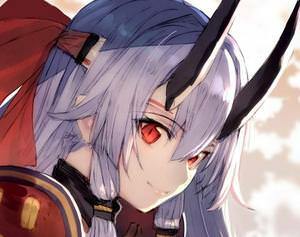 Reiko would narrow her eyes, grunting out a little in return as the two powerful women were currently locked in a stalemate. She would show a very slight smirk, just the corner of the right side of her lip curling up on that stoic face of the blond. The Lionheart would respond in kind, " Not too bad yourself..." Reiko let out as she would then suddenly flex her muscles even more. She'd take another step forward, then another. Trying to show up Pyrena and possibly push the woman back, wanting to show Pyrena that this would be no Hercules versus Nemean Lion tale. A back and forth would take place, both Amazons battling it out in a true test of strength. Pyrena was becoming more and more impressed as time goes on. It had been a long while since she had to put more into this and she was excited. Neither giving up ground at all, both between red and yellow. The stoic Lion would soon smile slightly, matched with Pyrena's own smile. Muscles flexing underneath flesh, even Pyrena showing off muscle on her traps. The Red Amazon soon felt Reiko pushing on to get more and more, and Pyrena meeting her halfway as they'd say. Their bodies coming close to each other, the Greek having to work on pushing this Nemean Lion back!